It’s very important to prep all the ingredients before starting this dish, as it cooks quickly. 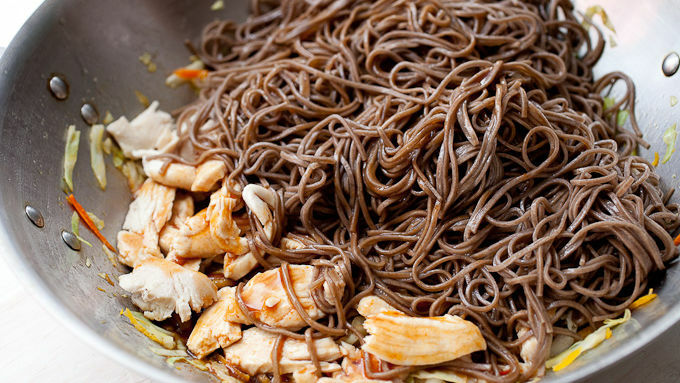 Cook soba noodles according to instructions, rinse with cold water and toss with sesame oil. 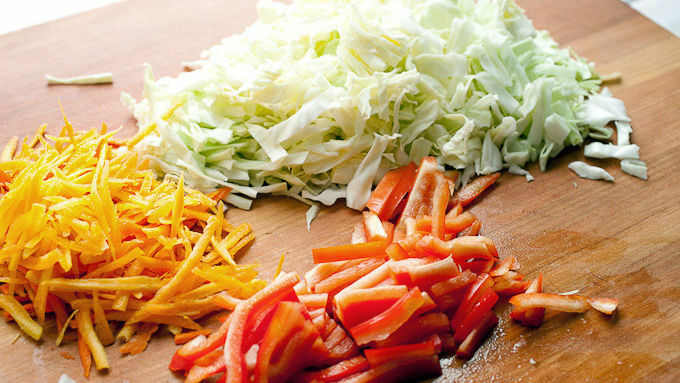 Slice chicken thin, shred cabbage, grate carrots and slice red peppers. 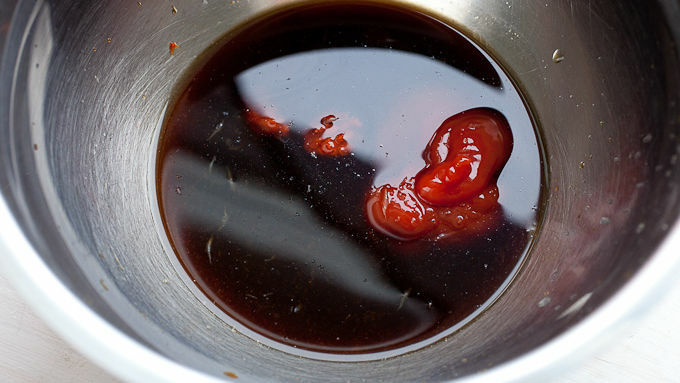 For sauce, whisk together ingredients until smooth. Heat a large wok or skillet over medium-high heat. Once hot, add oil and chicken. Cook chicken for 3-4 minutes until cooked through. 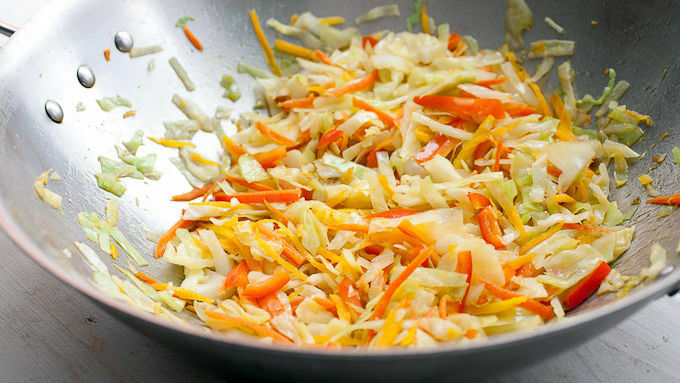 Remove chicken and add cabbage, carrots, and red peppers. If pan is very dry, add another drizzle of oil. Cook, stirring regularly, until vegetables are slightly soft, 3-4 minutes. 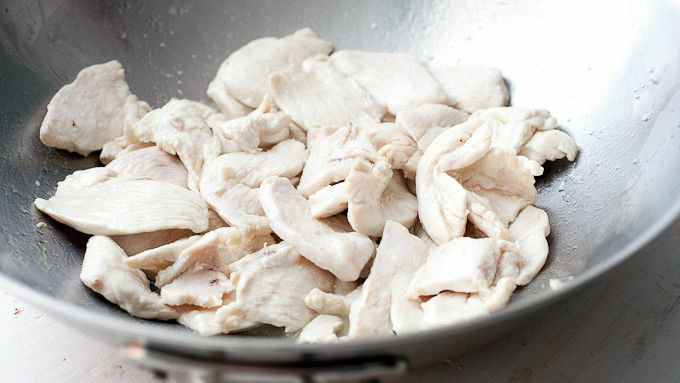 Add chicken back to pan along with noodles and sauce. Toss together for a minute or two to heat ingredients and let the sauce thicken. Serve up heaping bowls of the yakisoba with fresh cilantro. 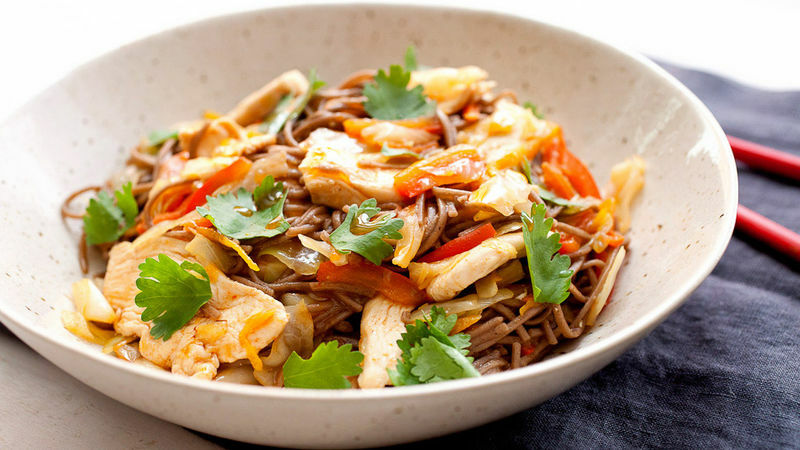 Check out this easy weeknight noodle dish. While its name might be new to you and sound exotic, I promise the flavors are familiar. 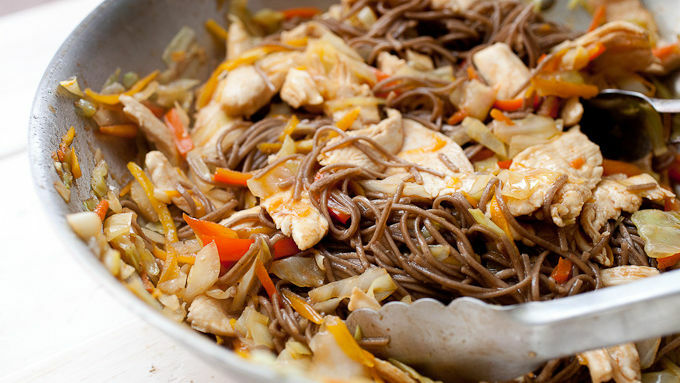 It’s essentially a simple noodle stir-fry dish that’s very popular in Japan. You can use almost any noodle, but traditionally soba (buckwheat) noodles are used—and they are my absolute favorite. The trick to making this dish is to make sure you have all your items prepped before you even turn on the stove. It all cooks really quickly, so if you don’t have everything prepped you’ll miss the boat. For the “soba” part of the yakisoba, you’ll need noodles! Like I said, I used actual Japanese soba, which cooks very quickly. If you can’t find these you could use almost any wheat noodle. Cook the noodles according to the package, rinse them well with cold water to stop the cooking, and toss them with one tablespoon of sesame oil to keep them from sticking. One more thing before we start cooking: sauce! Any good stir-fry noodle dish has a great sauce and this one is a perfect mix of savory, sweet, and salty. Serve this up immediately in deep bowls with fresh cilantro. Happy yakisoba eating!